An up-close head-shot of a brown horse, notice the tan coloration of the nose. Seal brown Holsteiner filly: Notice the darker coloration along the neck even though she lacks black on the legs. The color brown in horses has long been a source of ambiguity. Some registries handle brown as a separate color, while others consider all browns to be dark bay. Adding to the confusion, researchers, even as late as 2003, theorized that the darkest brown horses were actually black horses with mealy. It became apparent however, when the recessive allele at agouti (a) was located, that these dark horses with brown noses and flanks didn't test as black but as bay. Because no other agouti alleles were located, at the time, it was generally accepted that brown (even the almost black variety) was just a darker version of bay. This changed when Pet DNA Services of Arizona isolated the mutation that causes brown. Because of this advance, we now know that brown is caused by a mutation on agouti and, is in fact, separate from bay. The brown mutation is denoted At and is recessive to the wild type mutation (A). The order of dominance for the known agouti alleles is A, At,a. This means, that as long as the horse is allowed to express black pigment, (ie not ee) a horse with a genotype of AAt will be bay based while a horse that is AtAt or Ata will be brown based. (I use the term "based" because other dilutions, modifiers or white patterns may still be present.) 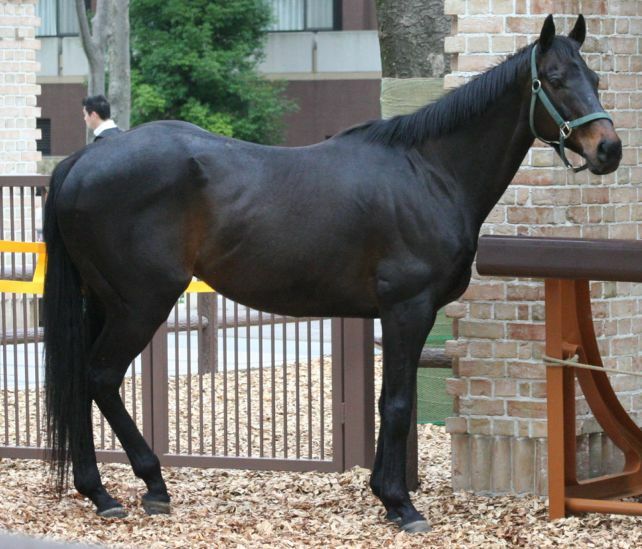 With the availability of a test for brown, one trend has come apparent, horses that are heterozygous for the brown mutation (Ata) are visually darker than brown horses who are homozygous for the brown mutation (AtAt). At first this may seem a bit counterintuitive but, think of the heterozygous horse (who will be darker) as being closer to black than the homozygous horse. It is also important to remember that while chestnut or sorrel based horses do not express brown they can still carry the brown mutation. It can then be passed on to their offspring and may express if the offspring inherits the right combination of genes from the other parent. Visual identification of the brown horse can at times be challenging. It can be difficult to tell a very dark brown horse from a faded black horse or a light brown horse from a bay horse. During the winter a brown horse will often fall into the "almost" black category, usually with a brown muzzle and/or flank. During the summer however, they will often lighten to "almost" bay. 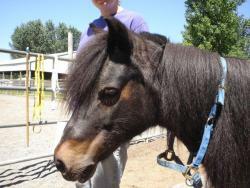 The affect can be compounded if the horse also fades during the summer. This color change frequently causes confusion among owners who aren't sure what color their horse truly is. 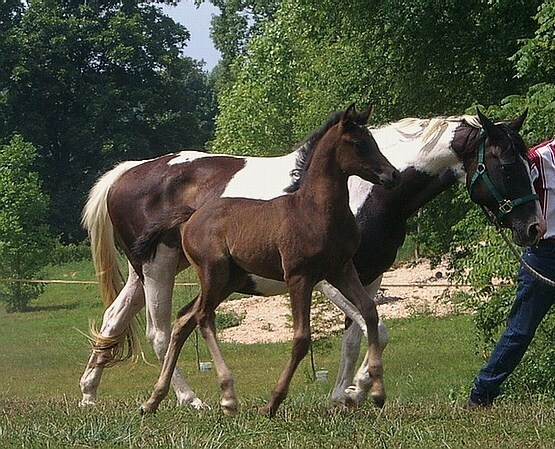 The brown horse will most often be born with an intense foal coat. This can include darker points and usually a darker topline, while the bay foal will generally have only black pasterns or may even lack black points completely. 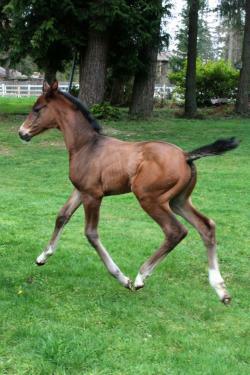 A bay foal will also have a much lighter coat without the darker coloration along the topline. The difference between a brown foal and a black foal is similar. 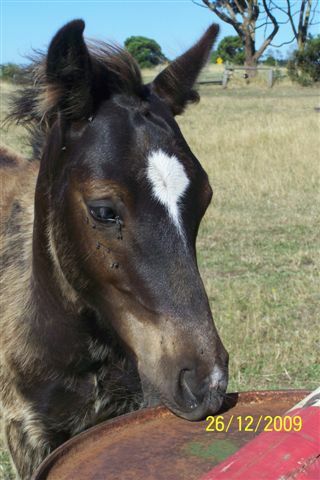 A brown foal will be born with darker coloration along the topline while the black foal can be born looking anywhere from "mousey" to "brown" to solid black but will generally be a more uniform color. Differences in adult coloration can be even more dramatic. During the winter a brown horse may be almost completely black but will have lighter areas in the "soft" parts of the body with the nose and flank area being the most common. Black horses that fade may look brown but the brown "fade" will be a different shade and these faded areas will generally disappear with the winter coat while the tan areas on a brown horse will remain and may even intensify during the winter months. At first, it may appear easier to distinguish a bay from brown however; a dark bay can be almost indistinguishable from a light brown. A very general rule of thumb is that a Bay will generally have a red tint to the coat and lack the general "smuttiness" that tends to accompany brown, while brown horses will lack this red tent and will instead appear to have tan highlights on a darker coat. It can take time and experience to confidently identify brown from black or bay and even experienced horse people can be fooled. Hopefully, as the test from Pet DNA Services is more widely utilized, some the ubiquity that has long surrounded brown will begin to fade. There really isn't alot known about how wild bay is inherited. As far as I am aware, no set pattern of inheritance has been discovered. Visually, it is a bay horse with "low" points or points that don't reach the knees. 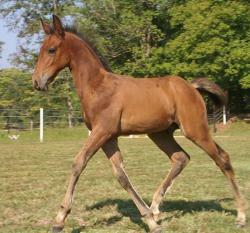 It is possible for young horses (some as old as 3) to display "low" points and then develop normal points as they age. Buckskins do not normally have pink skin or light colored eyes. Is it possible the horse could be an amber champagne rather than buckskin? There have been occurrences of light colored eyes in otherwise normal colored (non dilute) horses. It is not know what causes it. I would be very interested in viewing pictures of the horse in question. Without an image to go by, sun fading is the most likely explanation. If sun fading is out of the question you may need to have the horse tested for a mineral deficiency. Mineral deficiencies are known to affect color especially copper.